Bill Boeing, Jr. - Hall of Fame Inducts Bill Boeing, Jr. 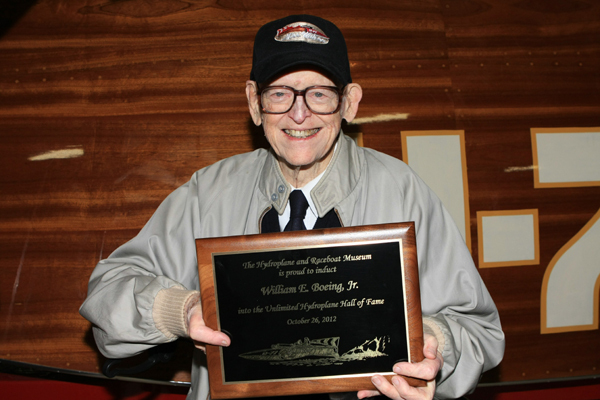 In a ceremony Friday evening at the Hydroplane and Raceboat Museum near Seattle, Bill Boeing, Jr. was inducted into the Unlimited Hydroplane Hall of Fame, just short of his 90th birthday. In the middle-fifties, when seemingly everyone was jumping on the hydroplane bandwagon in Seattle, Boeing tossed his hat into the ring. He teamed up with Ted Jones and Bill Waggoner to build three identical hulls that would be designed by Jones and constructed by Les Staudacher: the Miss Wahoo, the Shanty I, and a back-up hull owned jointly by Boeing and Waggoner that later became Miss Spokane. Boeing served as Chairman of the APBA Gold Cup Contest Board in 1959. Mira Slovak, the famed Czechoslovakian freedom flyer, was Bill’s driver in Unlimited racing. Slovak was Boeing’s personal pilot. Boeing’s boat raced as Miss Wahoo (U-77) in 1956 and 1957 and then sat out 1958, which is the year Boeing had Ron Jones, Sr., build the 280 Cubic Inch Class Wee Wahoo (E-77) that Slovak drove. Boeing’s first Unlimited race victory was the Mapes Trophy at Lake Tahoe in 1957. He went on to win the 1959 President’s Cup and the 1959 Lake Mead Cup. For 1959-60, Boeing changed his boat’s name and number to Wahoo (U-101.5). The 101.5 designation came from the frequency of an F.M. radio station in which Boeing had a financial interest. The Wahoo name was taken from Mrs. Boeing’s hometown in Nebraska. Boeing’s team switched from Allison to Rolls-Royce Merlin power in 1959. Wahoo “ran interference” for its Seattle Yacht Club teammate Miss Thriftway with Bill Muncey in the Final Heat of the 1959 Gold Cup. Wahoo was too far behind in points to have a chance at winning, but by holding off the Lake Mead Yacht Club challenger Maverick with Bill Stead, it was hoped that the SYC team could retain the Gold Cup for Seattle for 1960. The plan almost worked. Only one problem: Miss Spokane with Norm Evans jumped the gun and was penalized a lap. This moved Maverick up one position in the corrected order of finish and into a point tie with Miss Thriftway. Maverick was then declared the winner on the basis of a faster total elapsed time for the entire race. When Slovak crashed the Wahoo at the 1960 Seattle Seafair Regatta, Boeing announced his retirement from racing, although he did allow Slovak and the crew to run the boat one last time at the ill-fated 1960 Gold Cup on Lake Mead. Boeing sold the Wahoo in 1963 to Milo and Glen Stoen of Seattle who raced it (very successfully) as Miss Exide with Bill Brow as driver. The Hydroplane And Raceboat Museum of Kent, Washington, recently unveiled a magnificent full-size replica of Miss Wahoo in its 1957 configuration–a fitting tribute to Bill Boeing, Jr., for his contribution to the sport during its golden age.